In 2007, Ja Rule released the single Body to poor chart reviews. The original version featured Ashley Joi in the chorus. The original version appeared on Ja Rule's 2009 mixtape, The Mirror, which was actually originally slated to be released as a studio album in 2007. The song Body was allegedly written by Ja Rule while in a club watching some women dancing. The rabid remix of Body takes all of the original vocals and combines them with a new beat along with a high energy classic rock sample. If you've ever heard She's A Beauty by the Tubes, then you're sure to recognize the sample that is present throughout the song. Since this is probably my last release for 2016, I've made this remix completely untagged, meaning there are no "DJ Diamond Dog" samples anywhere. There are also 5 versions... a regular clean and explicit, an 8 bar extended clean and explicit and an instrumental. This is the grand finale to 2016 for me, so please take a minute to sample Body (rabid remix) by Ja Rule. Also, you can download it for your personal music collection as well. Thanks for all the support and patience this year. Here's to a new and improved 2017!! Last year's New Year's Eve countdown mix was so popular that I decided to put together another one. Although slightly shorter (only about 20 minutes), this one has just as much energy... if not more. The mix features all the hottest music from the past year (such as For Free, Broccoli and One Dance) as well as the classic club bangers (such as Get Low, Be Faithful & Let Me Clear My Throat). Everything is fully mixed and flows seamlessly from beginning to end. It was also done completely live. In fact, the only thing added to this mix post-production was the samples. So, if you're having a new year's eve party and want to be able to keep everyone dancing throughout the night, this is the exactly what you need. 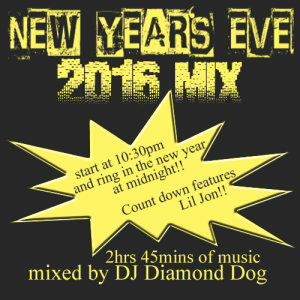 All you have to do is load this mix up on your ipod or computer at 10:30PM and Lil Jon will count down the last half hour, 10 minutes and 10 seconds precisely. One thing to remember is that if you are running the mix via bluetooth, there will be a slight delay. This single, long-play mix is exactly what you can use to get the party rocking and keep the party rocking!! You can sample the Countdown to 2017 Mix and you can also download the full, high quality mix for your personal collection. Remember, this mix has a wonderful selection of bangers for your party!! This is my gift to you all. Thank you so much for another year of support. Everyone have a very Merry Christmas and a happy and safe New Year! !